A patient portal is a secure online website that gives patients convenient 24-hour access to personal health information from anywhere with an Internet connection. Using a secure username and password, patients can view their health information. Protecting your personal information is a primary concern at Houlton Regional Hospital. 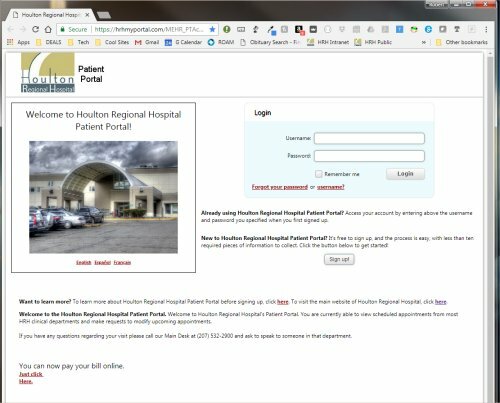 To access the patient portal you just need to take two basic steps..
Visit our admissions department or the HRH cashiers office and ask for access. They will provide you with a Patient Code. Here is the information you’ll be providing during the registration process. In particular, remember that the patient code is something given to you by our admissions department or cashier, so make sure you have that before beginning. After you click the signup button, you will find an instructional video and written tutorial on how to register. Those should answer most questions, but if you need assistance, feel free to call our helpline at (207) 521-2514 during regular business hours. We’re here for you.